Well, hello there, bloglandia. Do you ever feel like most jewelry findings are designed to look feminine? Even if they aren’t frilly or covered with hearts and flowers, there is often something innately delicate about most DIY jewelry findings. When you want to make beaded men’s jewelry, it can be a problem. Crimp beads and bullion just don’t look that tough! Luckily, jewelry designer Jeff Fulkerson invented a solution: the Bead Bandit. A strand of 8mm round beads make a simple, masculine bracelet when finished with a large clasp and Bead Bandits. This patent-protected device is made of two pieces that screw together, hiding the crimp bead or knot on the end of your beading wire or cord under a burly piece of metal. 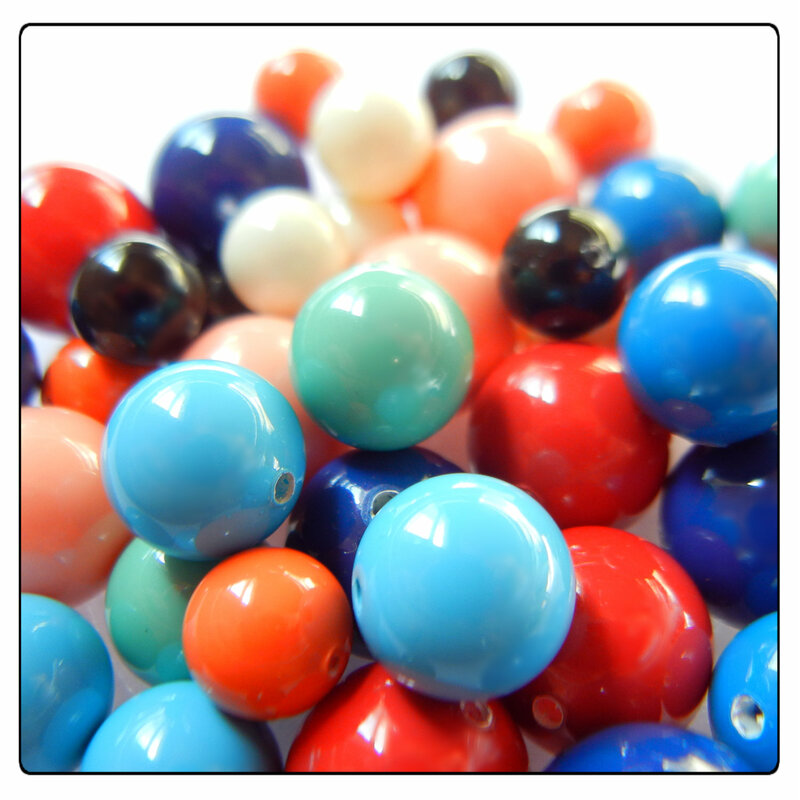 Bead Bandits are really easy to use: just unscrew the two pieces and string the small piece onto your beading wire. Knot or crimp the wire, trim, and then screw the cover into place. I found it easier to crimp than to knot the Beadalon, and with either method, I’d recommend adding a dab of glue just to make sure the crimp or knot doesn’t work its way loose over time. Attach a clasp with jump rings and you’re all done! For a complete list of parts for this bracelet, see our Design Gallery! Simple solutions are often the most elegant… or in this case, most manly. Hi bloglandia! It seems every new breakthrough in technology divides people into 2 groups – those in the know and those who aren’t! The most influential new site is Pinterest. Once you start pinning…either you’ll be really inspired – or completely glued to your computer! Either you are busy pinning your favorite jewelry designs, wedding cake toppers, nail polish colors and mason jar DIY crafts – or you have no clue what all the fuss is about! I think Pinterest is tons of fun for those of us who like pretty things (hi there, jewelry designers!!). Rings & Things has added new design boards for each of our Crystal Jams SWAROVSKI ELEMENTS bicone crystal bead assortments, and I must say, once you spend a bit of time searching for color-coordinated items, you start seeing the world in a whole new way! I braided four strands (4mm pink coral, 3mm light grey, 5-8mm rice pearls and 4mm bicones, with a few sterling silver rounds here and there) to make this statement necklace. For example, I started pinning to our Kiss From A Rose board, and suddenly the world just looked peachier! The more I looked, the more I found (and loved) examples of peach with gray. The gorgeous cone ends hide the messy cluster of cord ends and wire. Follow Rings & Things Design Team on Pinterest to see all our color inspirations, plus boards devoted to new tools and techniques. Rain. Sun. Wind. More rain. Gusts of sun. We’ve had it all this week! And yet, we (some of) the ladies of Rings & Things have ridden our bikes to work! Polly, Cindy, Amy, Melissa and Gretchen! Amy, in the middle, is our ETC. An ETC is an Employee Transportation Coordinator for Washington’s Commute Trip Reduction (CTR) program/law. Yes, law. For employers with more than 100 employees in one location, the state mandates compliance with the CTR, since people driving alone to work creates so much air pollution. Rings & Things doesn’t have to comply with CTR, but we like to be green! Plus the CTR offers fun prizes and incentives to reward people who use public transportation, carpools, bikes or their own two feet to travel to work. A lot of people use clothing issues as an excuse to not ride, so I feel like I must point out how nice we all look! Dresses, slacks – jewelry of course – Polly is even wearing a WHITE SKIRT. She is obviously much braver than I. BikeStyle, you should be proud of your fellow Spokanites! While none of us are sporting heels, I do admire Barb Chamberlain’s ability to bike in pumps. Again, she is obviously much braver than I. Finally, thank you to Roast House Coffee here in Spokane for contributing their most excellent coffee to the energizer station Rings & Things hosted on Wednesday morning for bike commuters heading to work. We all need to be alert on the road! Hi bloglandia! Take a look around and what do you see, fashion wise? That’s right: color. Big bold blocks of vivid color. These beads absolutely pop with gemstone colors. Incorporate this season’s love for pure color into your jewelry designs with Swarovski “gemcolor” crystal pearls. An easy to make bead bar necklace with red coral, pink coral, lapis, jade and turquoise crystal pearls. Red coral and turquoise is a classic gemstone combination. The pearl in the middle is ivory color. Coral, pink coral and jade crystal pearls. Dark lapis, turquoise and mystic black crystal pearls make a cool blue mix.